In the northeast and a few other places, Ascension Day was celebrated at it's proper time (on Thursday) and this Sunday is celebrated as the Seventh Sunday in Easter. in the one place --. become with us a witness to his resurrection." from which Judas turned away to go to his own place." This reading has particular relevance to the manner of governance of the Church, and the Church's teaching concerning apostolic succession. How the Church should be governed is no small issue. Although for many raised in the Catholic Church the question may seem obvious and settled, outside the Church debates rage about the proper form of church government (or "church polity"). When I was a Protestant pastor, the consensus among my peers was that the New Testament did not provide a model for the governance of the Church. I no longer hold that view. The principle of apostolic succession is that the leadership of the Church—by which we mean primarily (but not only) the bishops—were appointed by the previous generation of leaders, and they in turn by a previous generation, all the way back to the apostles, who appointed the Church’s first generation of leaders during their own lifetimes. Thus, the bishops are successors of the apostles in the sense that they fulfill the apostles’ role, which is one of leadership or oversight (episkope in Greek). We see this pattern in Acts. Acts 1:12-26, the replacement of Judas by Matthias, is significant. It does not prove apostolic succession. But it demonstrates two important points: (1) The apostles had a role or office, which did not necessarily cease with their death, (2) this role is described, among other things, as an episkopen, an “oversight” (“his office [episkopen] let another take”, Acts 1:20 rsv). Calling the apostles’ role an episkopen shows the connection between the apostles and the later leaders of the Church, who are called episkopoi (in English, “bishops”: Acts 2:28; Phil 1:1; 1 Tim 3:2; Titus 1:7). In fact, the English word "bishop" is a corruption of the Greek "episkopos." In Acts 1, the church is growing already (120 people, Acts 1:15) and the apostles are short on leadership, because they are missing Judas. So he is replaced by Matthias. The apostles are back up to full strength of numbers. In the beginning of the Church, they are able to perform all the roles of leadership, but this quickly becomes too much. They appoint more leaders to share the burden with them (Acts 6:3) by the laying on of hands (Acts 6:60). Later yet, the Church spreads all over the Mediterranean, to places the apostles cannot visit easily. Then, the apostles appoint other men to share in the “oversight” (episkopen). These men are called presbuteroi, “elders,” from which we get the English word “priest”: see Acts 14:23. In the beginning the distinction between presbuteroi and episkopoi is not clear: compare Acts 20:17 and 20:28. Later, these roles will be differentiated. It is like tissue in an unborn baby: at first the organs are one lump of cells, but they differentiate into different organs in time. In a similar way, the apostles had the role of bishop, priest, and deacon all wrapped in one, but these roles differentiate in time. All clergy share in Holy Orders and at least partially in apostolic succession, since they fulfill roles of leadership originally held by the apostles. The leadership of the early Church was always appointed by the apostles, not elected. (How does this compare with the practice of many non-Catholic groups?). This pattern holds in Acts and also the Pastoral Epistles (see Titus 1:5). Even in exceptional cases (like Paul, who is made an apostle directly by Jesus) such a person goes to the apostles to receive affirmation of their ministry (see Acts 9:27; Gal 1:18; 2:1-2, 9). If we ponder this principle of appointing leaders, we will see that it is a top-down structure, and it implies apostolic succession: all the church’s leaders, if legitimate, ought to be able to trace their appointment to the apostles, handed on in succession. Titus is Paul’s representative, his “child in faith” (1:4). 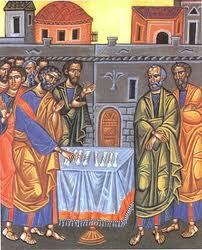 Paul tells Titus to appoint presbuteroi and episkopoi (elders/priests and bishops, 1:5, 7) for Crete in every town. Appointing such people was something Paul used to do personally [Acts 14:23]. Now he’s passing the authority on to Titus. This shows us apostolic succession. Take heed to yourselves and to all the flock, in which the Holy Spirit has made you overseers (episkopoi), to care for the church of God which he obtained with the blood of his own Son. 29 I know that after my departure fierce wolves will come in among you, not sparing the flock; 30 and from among your own selves will arise men speaking perverse things, to draw away the disciples after them. 31 Therefore be alert ... 32 And now I commend you to God and to the word of his grace, which is able to build you up and to give you the inheritance among all those who are sanctified.... 36 And when he had spoken thus, he knelt down and prayed with them all. 37 And they all wept and embraced Paul and kissed him, 38 sorrowing most of all because of the word he had spoken, that they should see his face no more. And they brought him to the ship. Paul knows he is being taken away from the Church of Ephesus. He will no longer be able to lead them, due to imprisonment and ultimately death (vv. 29, 38). He passes the torch of episkopen to them (20:28). Again, this shows us apostolic succession. The elders/overseers (in our usual terminology, priests/bishops) will guide the Church in Paul’s absence. so that they also may be consecrated in truth." One of the interesting things about Our Lord's language here is that "consecrate" (Gk hagiazo) usually means "ordain" in the Bible when applied to a human being. 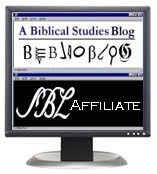 It is the typical word used in the Old Testament for the ordination of the sons of Aaron, the Levitical priests. Jesus is establishing the Apostles as a new priesthood to replace the old one. They will continue Jesus' priestly ministry, for Jesus himself is "ordained" (I consecrate myself for them). As we saw in our analysis of the first reading, this priestly ministry of the apostles will be handed on to their successors. John 17:20 “I do not pray for these only, but also for those who believe in me through their word, 21 that they may all be one; even as thou, Father, art in me, and I in thee, that they also may be in us, so that the world may believe that thou hast sent me. When every Christian believes "whatever is right in his own eyes" (Judges 21:25) the Church's witness to the world is completely diluted and becomes ineffective. Authority, unity, and mission are inextricably related. I don't know how much sense this will make, but I liken the Catholic Church to a "corporation". The very first ever created. The word, "corporation" comes from the word "corpus" or "body". We are the Body of Christ. When Jesus established the Catholic Church, He started an "ongoing concern". He appointed a Chief Executive and a board of Directors. And He gave them a mission. This Corporation then appointed directors and officers as "She" saw fit from then on. And continues to perform Her mission to this day. Its just a metaphor. And metaphors don't fit all situations. But it seems easy to grasp and helps explain the governing of the Church.